London is not exactly known as the biking hub of Europe, often lost in the shadow of Amsterdam. However, some new numbers from a Transport for London (TfL) mass census show that cyclists make up 24% of the city’s morning rush hour street traffic. At Theobalds Road near Holborn, bikes were 64% of all vehicles heading west, while Elephant and Castle, one of London’s most notoriously frightening roundabouts for cyclists (which Boris Johnson once said was “fine” for cyclists) saw 903 cyclists per hour head north to the city centre between 7am and 9am. While the budget for cycling remains exceptionally low for new infrastructure, Gilligan is still optimistic as more people opt for bikes, and says it is one of his top priorities. Not only are city residents more likely to bike to work if given the opportunity, but City Hall also says there is more return to be had for money invested in cycling as opposed to other transportation systems. If cyclists and city commissioners continue to be persistent, London could see an even greater surge in commuters on bikes in the coming years. It’s good news that more cities are starting to cater to the needs of health and earth-friendly cyclists. 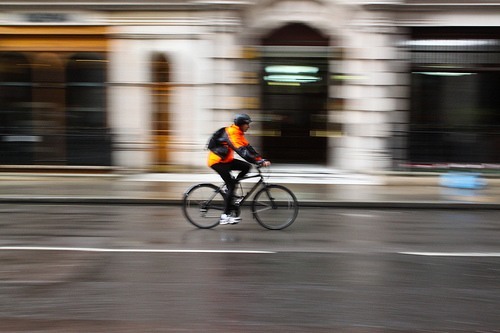 Image CC licensed by Geraint Rowland: Cycling in London. Previous post: US To Double Electricity Access In Africa: What’s In It For Uncle Sam?